The Oppo UDP-203 is a feature-packed UHD Blu-ray player that excels in 4K footage and lossless audio. This could be the ultimate addition to your home theater. Despite the format selling over a million discs, many people still see UHD Blu-rays (and their players) as the preserve of rich cinema fans who don’t mind shelling out top dollar for the best possible audio and visual experience, and the Oppo UDP-203 does little to dispel that notion. This is not a budget UHD Blu-ray player (for that you’ll want the still-relatively-expensive Panasonic DMP-UB700), but a costly bit of entertainment kit that comes with a lofty price tag (£649, $549, around AU$949) that’s expensive even by UHD Blu-ray player standards. While many people will baulk at that price, Oppo has gone a long way to justify it by making the Oppo UDP-203 a feature-packed device that’s both forward- and backward-looking. It’s forward-looking in that it supports some of the latest formats and technology, including HEVC, H.264, VP9 4K, and Hi10P video codec decoding, HDR10, Hi-Res audio – and it'll be future-proofed for a good while yet thanks to Dolby Vision support, which has now been released as a firmware update. It’s backward-looking – and not in a bad way – in its support for legacy standards that have been dropped by many of its competitors, such as SACD, which means the Oppo UDP-203 is a compelling purchase if you want a single device that plays pretty much all of your disc-based media. While many outside of its native China will associate Oppo with smartphones (such as the Oppo F1 Plus), the company is also well regarded when it comes to making solidly-built devices, and its reputation is maintained here. A high-precision disc loader with balanced laser makes loading discs quick, with the mechanical disc tray rigorously tested to ensure it works smoothly and reliably. A smooth-running disc tray is probably not high on many people’s lists of demands when it comes to buying a UHD Blu-ray player, but this attention to detail makes the Oppo UDP-203 feel like a luxury product. The high-end feel extends to the rest of the Oppo UDP-203, with a brushed aluminium front panel and steel chassis giving it a sturdy yet elegant design. It would look right at home nestled amongst other high-end AV equipment, with the front LED display showing playback information, along with which audio and video codecs are being used. A full-size remote is included with quick access to all the important commands, and it lights up when used, making it easy to navigate even when you’re watching movies with the lights turned off. At the rear of the Oppo UDP-203 are two HDMI outputs, one for video and audio, the second for audio only. This is a common feature of UHD players, and allows people with audio receivers that don’t support 4K or HDR to still receive lossless audio, as the first HDMI goes direct into the TV, and the second into the audio receiver. There's also a third HDMI port – although this is an HDMI input, rather than an output. It enables you to plug another HDMI device into the Oppo UDP-203, so that it uses the same HDMI input on your TV or AV receiver. It’s a useful feature if you’re running out of HDMI ports on your TV or AV receiver. However, when plugging a PS4 Pro into the HDMI in, the PS4 Pro stated that the display it was plugged into was 4K, but not HDR (when it was). If the HDMI in the Oppo UDP-203 does not support HDR that would be a real missed opportunity, as many TVs ship with only one or two HDR-enabled HDMIs. We’ve reached out to Oppo for confirmation. Further bolstering its media-playing credentials, the Oppo UDP-203 comes with optical, coaxial and 7.1 channel analog audio outputs, meaning you shouldn’t have a problem hooking this up to an AV receiver. If you want to play digital media then you’re well covered, with two USB 3.0 inputs at the back, and one USB 2.0 port at the front, as well as a rear Gigabit Ethernet port and built-in Wi-Fi for playing media from your networked devices. The Oppo UDP-203 supports DLNA, and it quickly found our NAS (network attached storage) device, which holds our collection of digital media. The interface for browsing the contents of our NAS was simple, yet easy enough to use, and thanks to the UDP-203’s wide support of video and audio codecs, we didn’t have trouble playing any of our video or audio files natively, including Hi-Res audio files such as FLAC (which sound amazing thanks to the Direct Audio feature that turns off unnecessary electronics within the Oppo UDP-203 when playing audio files to minimise interference) and MKV. Audio file playback (as well as playback of CDs) is made more visually attractive with the inclusion of metadata and album artwork. The robust (and easy-to-use) network streaming support kind of makes up for a rather glaring omission with the Oppo UDP-203 – there’s no support for streaming services such as Netflix or Amazon Prime. For many people this will seem surprising, as most UHD Blu-ray players come with Netflix and Amazon apps installed. One could argue that because most devices (including the TV you’re probably plugging the Oppo UDP-203 into) have Netflix and Amazon apps, the fact that this Blu-ray player doesn’t offer those services won’t be too much of a hardship. That’s fair enough, but it also means you need to swap between devices if you want to catch up on the latest Netflix original TV series, and it detracts from the Oppo UDP-203’s credentials as an all-in-one entertainment device. We tried the Oppo UDP-203 with a range of UHD Blu-rays and image quality is, as you’d expect from a player of this price, absolutely fantastic. We hooked up the Oppo UDP-203 to the excellent HiSense 65XT910 4K HDR TV, as well as an Onkyo TX-NR838 AV receiver with Monitor Audio Radius 270 5.2 speaker setup. We first played X-Men: Days of Future Past and Deadpool UHD discs. Both of these films have dark scenes and muted color palettes, allowing the HDR support of the Oppo UDP-203 to shine. Colors are reproduced consistently and accurately, and little details (such as the fabric of Deadpool’s costume) really elevate the footage. The image quality looks fantastic straight out of the box, so you may never feel the need to go into the settings menu, although if you do you’ll see plenty of options, such as output resolution and frame rate, including UHD at 24, 50 and 60Hz, color space options up to YCbCr 4:4:4 and color depth of 8-bit, 10-bit and 12-bit HDR output. So, while we were very impressed with the default performance of the Oppo UDP-203, with most settings on automatic, there are plenty of tweaks you can make to get the best possible viewing experience for your setup. We switched films to Mad Max: Fury Road, another great UHD transfer that offers a far brighter and vibrant palette, and again the Oppo UDP-203 performed admirably, with brilliant details and accurate colors that complement the film’s washed-out aesthetic. Mad Max: Fury Road is also a film with fast-paced action, and the Oppo UDP-203 keeps it flowing smoothly. Overall, the visual reproduction of native UHD and upscaled 1080p Blu-rays on the Oppo UDP-203 is exemplary. Loading up Blu-rays took just over 30 seconds, and if you pause a disc and turn off the Oppo UDP-203 you can resume from where you left off next time you turn on the device. The menu isn’t flashy, or as nicely designed as ones we’ve seen on other players, but it does the job, giving you quick access to your media. Audio is also well covered with lossless Dolby TrueHD and DTS-HD Master Audio support, both of which sound absolutely fantastic. The UDP-203 also supports Dolby Atmos and DTS:X 3D positional soundtracks, which utilise overhead speakers (or ‘bounced’ sound from up-firing speakers) for more immersive sound. Support for Super Audio CDs (SACD) will be good news for the small number of people who have them – and luckily I am one of those few, so I put in my go-to SACD, the classic Dark Side of the Moon from Pink Floyd, and gave it a spin. Not only does the SACD of Dark Side of the Moon have increased audio quality thanks to a much higher bit rate, it was also remixed to 5.1 surround sound. If you’re familiar with the album you’ll know it makes extensive use of sound effects, and the 5.1 remix sounds phenomenal, with aggressive use of the surround channels mixing sounds with the band’s instruments to produce an immersive soundscape – and the Oppo UDP-203’s playback was phenomenal, so much so that I don’t think I can go back to listening to the album in stereo. 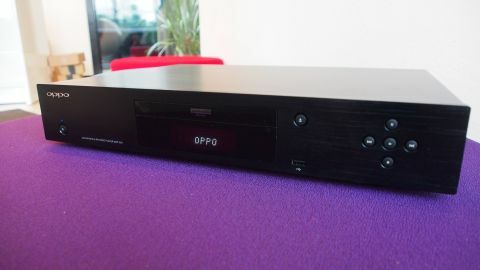 Oppo’s inclusion of SACD and DVD-A support won’t mean much to many people, but if you’re lamenting the abandonment of a format that had so much to offer, the Oppo UDP-203 could be for you. On a completely unrelated note (well... sort of), the UDP-203 also supports 3D, and comes with a wide range of options to tweak the stereoscopic image.